Cap 4-12 mm broad, convex, expanding to nearly plane, the disc occasionally slightly raised; margin at first incurved, then decurved to nearly plane; surface conspicuously wrinkled, sometimes striate-rugulose at the margin, minutely hair; color: orange to orange-brown, slightly darker at the disc, in age fading to dull apricot-orange; flesh thin, virtually undetectable with the unaided eye; odor and taste mild. Gills adnate, cream-colored, subdistant as viewed with a 10X hand lens; lamellulae up to three-seried. Stipe 1-3 cm long, approximately 0.5 mm thick, bristle-like, pliant, round, sinuous, equal, not institious; surface when young, minutely pruinose overall, apex translucent white, the lower portion dull vinaceous-brown, dark brown at the base; at maturity, surface typically glabrous except for the apex which remains slightly pruinose and the stipe base which is pubescent and attached to the substrate via pallid to yellowish-buff hairs; partial veil absent. Spores 8.5-10.5 x 3-4 µm, subfusiform (spindle-shaped) to elliptical, smooth, thin-walled, inamyloid; spore desposit not seen. Scattered to gregarious on leaves and litter, e.g. grass stems, pine needles, cypress twigs, and blackberry canes; fruiting in late summer in watered areas and after the fall rains. 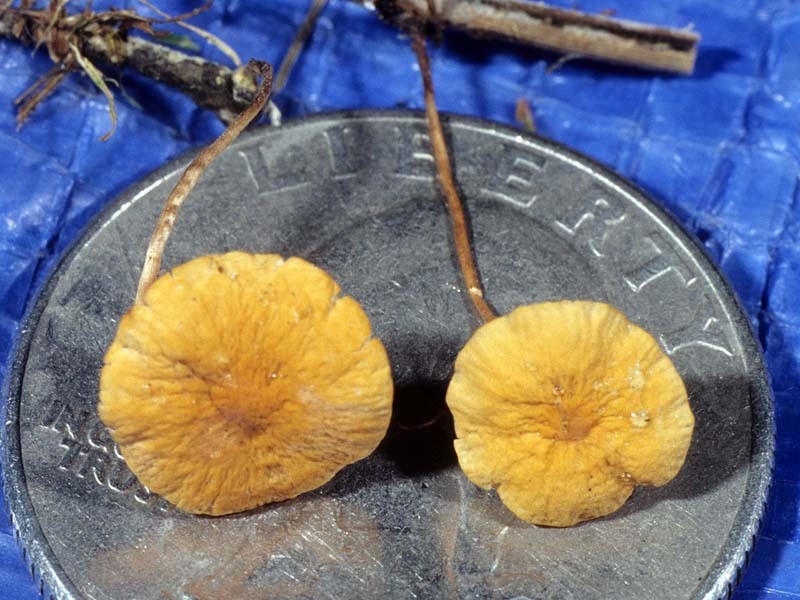 This rare member of the Marasmius clan is characterized by its tiny size, a wrinkled orange-brown cap and bicolored stipe--vinaceous-brown at the base and whitish at the apex. 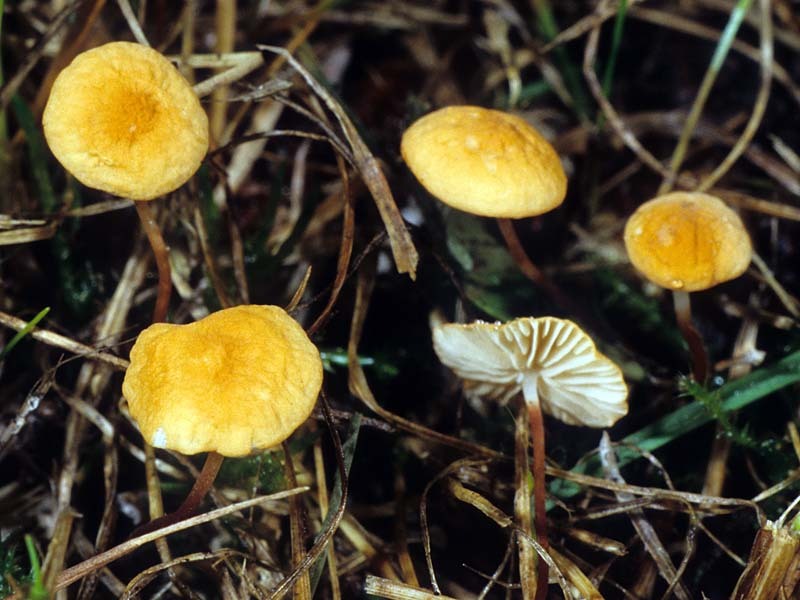 It resembles somewhat another litter decomposer, Mycena oregonensis, but the latter has a smooth, not wrinkled cap and a differently colored stipe. Characteristic of the genus, dried specimens can be revived when moistened. 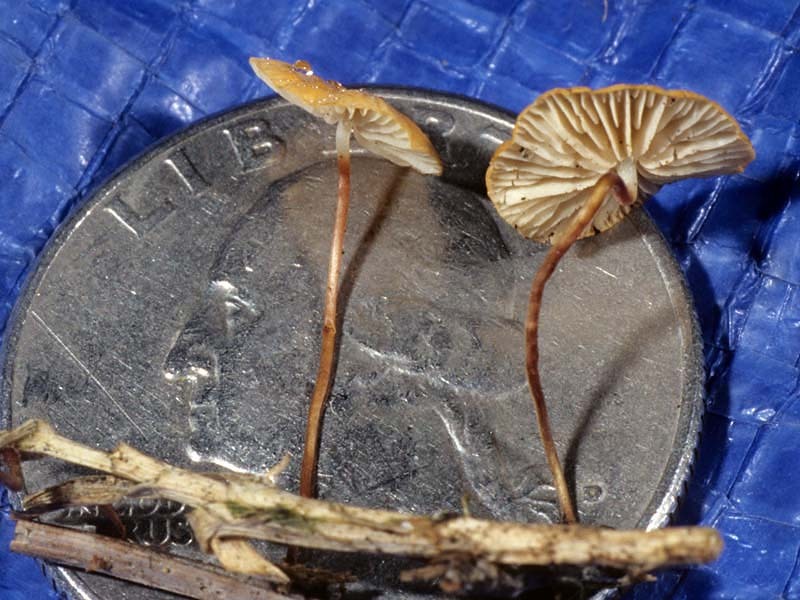 Michael Wood: Marasmius armeniacus (CP) — these are small!